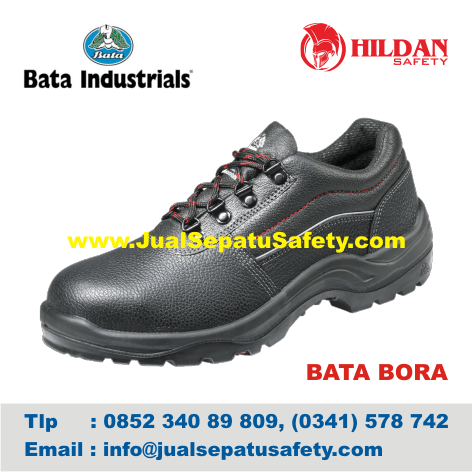 Detail Produk "Sepatu Safety BATA BORA"
The BATA BORA safety shoes is a great shoe in Logistics, Manufacturing, Automotive and Cement industries. The BORA is a low model safety shoe in safety category S1. Safety shoes with S1 are for occupational use with safety toecaps, can withstand an impact up to 200 Joules and compression of 15 kN. S1 shoes also satisfy a whole list of criteria, including many different quality standards for shaft and sole, comfort requirements, minimum slip resistance and oil resistance. S1 safety shoes also feature anti-static properties, and energy-absorbing and closed heel.